WASHINGTON — U.S. officials are not sure that $702 million spent on ammunition for Afghan forces from 2015 to 2016 was used for its intended purpose, according to a recent Defense Department inspector general’s report. “Without consistent, timely, and accurate reporting from the ministries, CSTC-A [Combined Security Transition Command – Afghanistan] cannot account for all ammunition consumed by the ANDSF [Afghan National Defense and Security Forces],” the report reads. The main mission of the CSTC-A is to train Afghan institutions on effective management, oversight functions and rule of law. The unit’s function is to train Afghan ministries on how to run cost effective and efficient management systems. But, according to the recent IG report, the unit failed in its own oversight functions and further refused to enforce punishments on Afghan government organizations that failed to live up to commitments made to the U.S. government. However, the unit claimed it was hampered by understaffing and security limitations, which prohibited the group from conducting physical inspections to validate ammunition reports below the corps and zone level in Afghanistan, according to the report. “CSTC-A did not provide effective oversight of ammunition that was procured by the DoD and provided to the ANDSF,” the report reads. Moreover, the CSTC-A failed in its responsibility to oversee commitment letters from various Afghan ministries. Commitment letters from the Afghan government are intended to ensure equipment and services provided to the Afghan government from the U.S. are used for their intended purpose. According to the IG report, “CSTC-A only enforced one penalty” on the Afghan government for its failure to abide by commitments despite that the unit found Afghan ministries failed to meet commitments on 36 of 55 assessments. Officials at the CSTC-A refused to carry out punishments because they were worried that it would impact Afghan readiness, according to the IG report. This appears to be a common theme in Afghanistan where corrupt ministries continue to plunder U.S. aid with near impunity. U.S. officials have been hesitant to enforce strong conditions-based aid in fear of its potential impacts on the battlefield. John Sopko, the inspector general overseeing Afghan reconstruction, told a crowd at a think-tank event in Washington last week that conditions were so weak you could drive a Mack truck through them. He further called on U.S. officials to strengthen conditions-based aid. The Afghan government has had difficulty managing the large quantities of arms and ammunition supplied to its security forces by the U.S. Large stockpiles of those supplies have gone unaccounted for in the past either through corruption or battlefield loss. According to an assessment by a UN monitoring team, their findings “suggested that significant quantities of arms and ammunition from Afghan military stockpiles in fact remained unaccounted for,” according to the report. Large quantities of sophisticated foreign weaponry to include night vision devices, laser sights and optics have wound up in the hands of Taliban and ISIS fighters, according to the UN team report. Incidents “had reportedly grown and could no longer be explained solely by individual incidents of theft or battlefield capture,” the UN assessment reads. The U.S. has spent more than $70 billion dollars since 2002 rebuilding Afghan forces, Sopko told audience members last week, and is set to spend over $3.7 billion in the coming year on the fledgling force, according to a Defense Department budget request for Afghanistan. 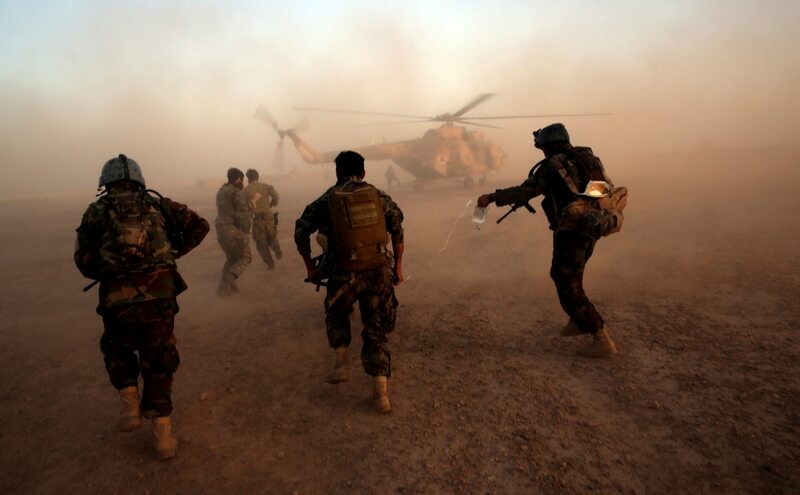 The recent IG report highlights an endemic problem in Afghanistan, that much of the aid provided to rebuild Afghan forces largely goes unaccounted for, only to end up in the hands of enemy forces. Because the CSTC-A failed in its oversight mission the U.S. lacks accurate ammunition consumption data, meaning “future ammunition requirements may not be valid,” according to the IG report. After 16 years of war the U.S. is still unable to accurately track and forecast the needs of Afghan forces, as corruption issues still largely go unaddressed.